Childbirth is “a truly murderous business,” the Scottish actress Tilda Swinton told reporters today at the Cannes Film Festival. “It’s violent. And if one doesn’t embrace that, if one can’t embrace it — and it’s really tough to do that — then you’re up a gum tree because it means you’re going to be cutting off a whole part of yourself,” said Swinton, 50, the mother of teenage twins. 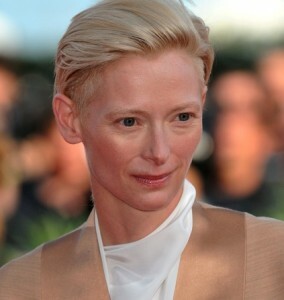 Swinton told reporters that movies and television give people an idealized vision of birth, according to a story by Anita Singh in the Telegraph, a British paper. “In movies, and particularly in television films, when people have babies, they are sitting in a hospital room and there are flowers everywhere. They are made up, magically, and they have a baby in their arms and it’s all really lovely,” she said. Swinton made the remarks while discussing her latest film, "We Need to Talk About Kevin," directed by Lynne Ramsay, which is generating major buzz at Cannes. The film is based on a 2003 novel by Lionel Shriver. This entry was posted in Childbirth and tagged Anita Singh, Cannes Film Festival, Childbirth, Lionel Shriver, Lynne Ramsay, Telegraph, Tilda Swinton, We Need to Talk About Kevin by Delia. Bookmark the permalink.